Glossy White Nail Polish Rack French Baroque Style with LED lighting....A stylish and unique storage solution for ALL that nail varnish.. This stunning display frame is just beautiful to look at, the frame is a lovely satin white Baroque style with white gloss shelves and a gorgeous white sparkle wallpaper. This stunning display frame is just beautiful to look at, the frame is a lovely satin white Baroque style with white gloss shelves and a gorgeous white sparkle wallpaper. Each shelf has illuminating lights on it to highlight your products to their full potential. This massive frame is ideal if you have a lot of polish such as a nail bar as each display frame will hold up to 300 polish (depending on brand used could be more or less). 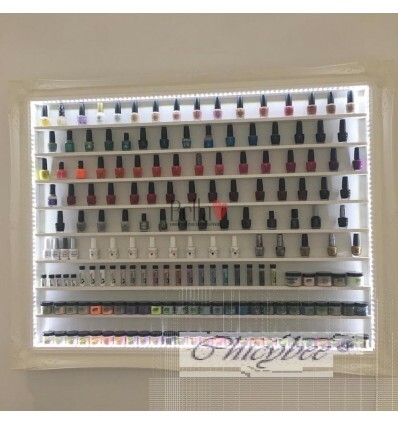 The photos you see here are of a new nail bar that has just opened and they were designed specifically to match the clients décor by size and style. I am sure you will agree they make a very stylish and bold statement and offer a unique modern way to showcase your products. You can really see the difference the bright white LEDs make to the style by illuminating the sides. The over all size of each frame is as follows and is the price of one frame with LED lighting - or without. lease bear in mind these are all hand made display cabinets and as such are made to order. The lead time is normally 3-4 weeks but if we have one already in stock then it will be dispatched sooner. If you have a new salon opening or a launch date to meet then we can often accommodate this so please do ask.